I singled out the Felt Tip Eyeliners over Gel ones, obviously the cult fancy, Maybelline Drama Gel Eyeliner. I liked it too... at some indefinite point of life. Maybe, I am the only one who did not repurchase. I still have the swirl one, used once or twice but that isn't half good as the Black one. No, this is not what I like I want Bourjois Felt tip Eyeliners, all of them. I bought the Bourjois Mega Liner, from Asos. It was not launched in India, I'm not sure if it is. I have given and discared most of the stuff already, Oh the horrid 'Makeup Academy Uk' products, I'm talking about. The Bourjois Mega Liner is still pitch black with no sign of running out, believe me even though It was the only eyeliner I've used since October 2014. I planned on Physicians Formula and NYX Eyeliners, but I would've to wait till June for that! And then I came across this when I was browsing through the website figuring out what I would need to try! Definitely a microfiche of the NYX 'The Curve', an award winner for $15 approx. 975 INR! I am hoping it is decent enough for me to commit to it. I am not expecting a lot. Honestly! 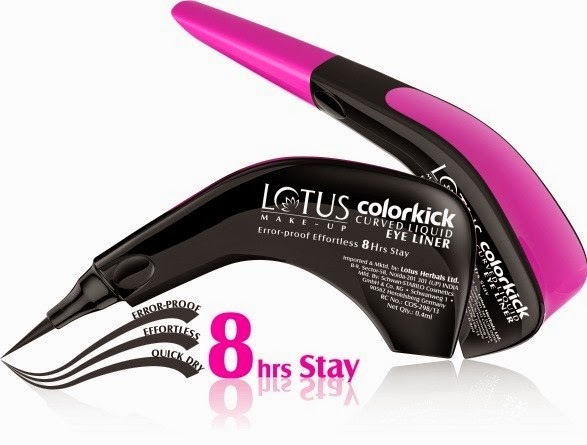 I am heading to the Lotus Herbals counters today and trying out the shades, get hold of the eyeliner and a lipstick from newly launched shades.